The Hyundai Santa Fe is a premium SUV that had at one point outlived its shelf life when the price bracket it existed in got run over by the Germans. At a similar price point people preferred the brand value of BMW or Mercedes or Audi over that of Hyundai leading to a slow death for the Santa Fe. In an increasingly crowded space and one that will only get even more crowded shortly the Santa Fe just does not make sense. 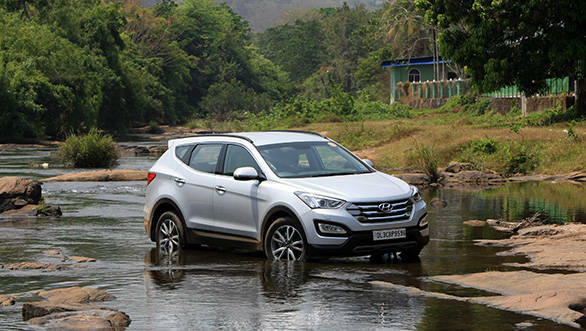 Curiously enough Hyundai India isn't willing to let go of the Santa Fe, it just isn't willing to pull the plug and after having driven it myself, I can see why they are so adamant. So I'm going to skip the history of the Santa Fe and where it came from and what it did. All I will mention here is that it came into the Indian market, did extremely well in its initial years and then sales literally just fell off a cliff. Shift focus to 2013 and Hyundai showcased an all-new Santa Fe whose design language is an extension of Fluidic Design called the Storm Edge. Its is a highly evocative tag for a design form that instantly helps identifies the Santa Fe anywhere in a crowd. It simply stands out, makes people gawk and steal second glances. The interesting bit is that the design of the Santa Fe is literally teetering on the sheer edge between bold and loud. One wrong stroke of a pencil in a designer's hands and it could easily have been ostentatious and noisy. Instead its a superb shape that lends a whole new character and stance. Its graceful, strong, full of character and hard to miss! It is without a doubt a damn good job on the outside. Move inside and the high notes continue to sound off what is essentially a good design but also typically eschewing what Hyundai has shown off in their sedans and hatchbacks. The interiors look crisp and modern and stylish though I personally am not a big fan of those swoops lines and would much prefer some more solidity. Everything also isn't positive in here and there are definitely some areas that could have been treated in a less miserly fashion. I'm referring to the centre infotainment screen that enables touch control but is such a small display it almost feels like someone is correcting their mistake. In a SUV this large it looks ridiculously out of place and definitely demands a rethink and execution. 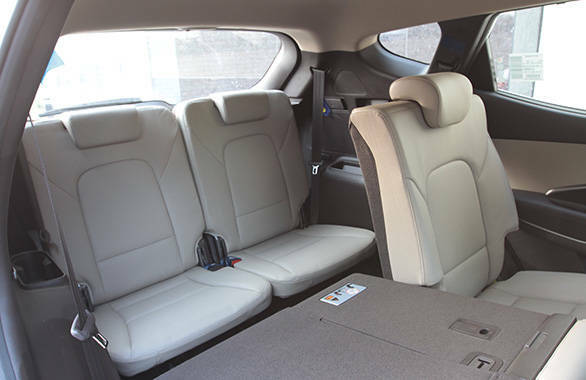 The Santa Fe is a generously large SUV and seats seven passengers in three rows of seating. The last row is generous enough but because there is very little height to the seats you basically sit with your knees touching your chin. The middle row can be adjusted for reach and that only complicates matters in the last row. Ideally that space is best reserved for children. When not required the last row seats fold into the boot area and this provides generous boot volume which can further be expanded by folding down the middle row of seats. The driver's seat is the only one to get power adjustment while the passenger has to manually adjust his seat. There will be three options offered to the customer, there is one manual transmission variant and two automatic transmissions. The engine in all three is the same, a next generation R series engine that has been worked on to enhance efficiency, reduce friction and provide better NVH than before. So the engine is the new 2.2-litre CRDi unit that delivers 197Ps of max power and two torque outputs. In the manual you get 420Nm of max torque but the automatic gets around 16Nm more, both between the same 1800-2500rpm. The new generation common rail direct injection diesel displaces 2199cc and its a quick and responsive engine. Having said that I must also comment on the noise within the cabin, despite the claims of NVH being up to date, you can definitely hear enough of the diesel engine clatter. An electronically controlled variable geometry turbocharger kicks in early enough to ensure power delivery is linear and immediate. Where efficiency is concerned, Hyundai claims 14.74kmpl for the manual and 13.01kmpl for the AT, these being ARAI figures. 1800bar rail pressures pumping fuel through piezo-electric injectors, the electronically controlled variable geometry turbo, swirl control valves and and electronically controlled EGR ensure that the fuel efficiency is optimised. I did not get to drive the manual and while is obviously the more fuel efficient variant, what is apparently becoming increasingly clear is that a lot of customers in the past have opted for the automatic transmission Santa Fe. That explains why Hyundai is sort of giving the manual version the step motherly treatment. In this case the automatics also get all the bells and whistles while the manual is more of a basic or lesser specced variant. Both transmissions however have six forward ratios and the automatic adds a manual shifter to the equation. So the automatic is remarkably easy to drive. Even the automatic shift quality is surprisingly agile and not slow. Power is derived instantly and acceleration as a result is brisk and hurried. On the chassis front there have been several updates giving it a more secure feel. A MacPherson strut at the front and multilink suspension at the rear gives it better dynamics than before. There is still a fair amount of body roll but what I did like is that it is well controlled and measured. Never did the Santa Fe feel like it was losing comfort or getting too hairy. Of course there are a host of safety nets to reign you back in but still its a very decent handling SUV. With the chassis also come a few other changes. The steering for instance can be set up to match the effort you want to put in. So a comfort mode makes the steering light for urban duties, a normal mode adds some more weight while a sport mode significantly increases resistance in the steering feel while also making it more precise. The Santa Fe's advanced traction cornering control system utilises torque vectoring between the four wheels and braking power to reduce or eliminate understeer. The system proved its worth on certain tight twisty sections on the roads to Athirapally and I can vouch that the dynamics were not just up to date but also fun. Coming around finally to the features, the Santa Fe has a whole array of comfort and convenience features to offer to its consumers. Of significant interest would be the six airbags on the safety front alongside the host of dynamic control systems. You also get LEDs and high intensity discharge headlamps. 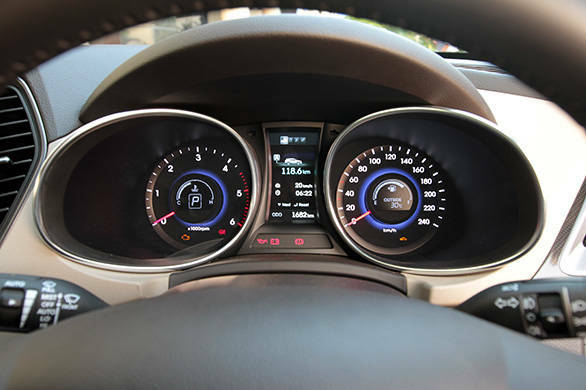 The driving lamps have a cornering function in them and then there is the cruise control and the air conditioning for all three rows of seats and a host of controls on the steering wheel and what not. The list is exhaustive and rich. So yes the Santa Fe continues to be just as good as it always was, and the improvements to every aspect make it a much more rewarding purchase. And that brings up the big question, at 26 lakhs for the base variant ex-showroom Delhi stretching all the way up to around Rs 30lakhs for the top of the line variant is the Santa Fe truly value for money? Look at it like this, if you weren't looking for badge value there is hardly anything in this segment that offers you the luxuriousness, styling, ride, handling and performance that the Santa Fe has to offer. Of course you could buy a German luxury SUV but take it from me, there really isn't much difference. 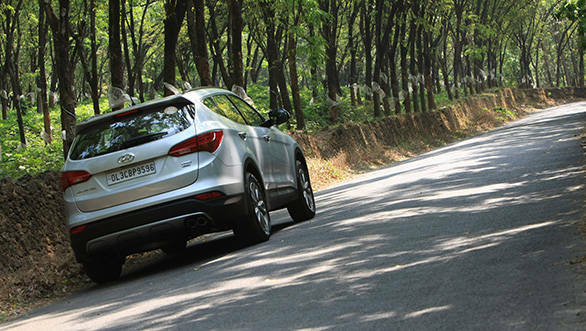 The German brigade in fact offers stiffer suspension setups that aren't suited to Indian road conditions, they cannot seat seven and they definitely don't have the richness of features the Santa Fe can offer. To me that is definitely better value, even though there is still a shred of doubt at the back of my head. The Santa Fe is a well endowed SUV but it might just not be a hot item at the box office!